Am I the only one who organises their genealogy files by the type of record? From browsing numerous blog posts and "how-to" sites, it seems like everyone else has their information filed in some variation of a surname system. The reason that I'm thinking about this now is that it's time for some routine maintenance of my system. I need to catch up on filing I should have done, make sure I have both hard and electronic copies of everything, and do some general fine tuning to accommodate the variety of record types that I'm now seeing. Newspaper clippings, for example, really need to move to a dedicated folder after all the digging about I've been doing on Trove! Plus, I want to literally straighten up my folders, either by using shelf dividers or by replacing them with folders that aren't quite so floppy. Given that I need to work on my filing system anyway... if I was going to make a change, now would be the time to do it. But before I discuss any possible changes, let me describe my current system more fully. The majority of items in my birth, death and marriage folders are certified copes of certificates from Victoria, Australia. I arrange them by year and registration number. I also note the name of the person or couple. I need to decide what to do with registrations in other jurisdictions, and the baptism entries that have snuck in. I'm thinking a subdivision in the folder for each jurisdiction, and a separate folder for baptisms. Burial information is grouped by cemetery, then by name(s). Immigration records are organised by date and ship, plus name(s). Census records are by year, then place, then name of head of household. The large unlabelled folder contains a copy of a long family history manuscript (by another author, many years ago) for one of my branches. The Indexes folder contains print outs of microfiche index pages (yes I've had it a while!) and more recently some database search results on particular surnames that I thought I may want to refer back to. I also have folders for correspondence, wills/probate, inquests, and various other bits and pieces (newspaper clippings, pages from books etc) and of course proper archival photo storage for my precious original photos. My electronic filing system matches my hard copy system, so I only need to work out where a document goes once. The folder and name for my electronic files also reflect the patterns I've described for filing hard copies. Or at least, it almost does and it will again when I've done my routine maintenance! Each document needs to be filed only once, reducing filing workload and storage space. The hard copy and electronic filing systems are consistent. I only need to work out where to file things once. It is quick and easy for me to put my hands on any document. It is logical - someone else should be able to work out what things are and where to find them. So with these advantages, why am I considering change? Meanwhile, I'd be interested to hear more about other your filing system in a comment or a blog post (new or old). I know what I'm going to say in Part 2... but Part 3, where I describe my decision, is changing by the minute! 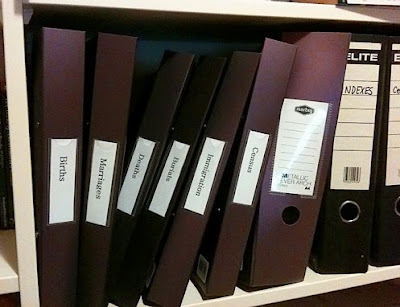 Both my hard files and electronic files start with the surname, but from there they go to type of file: birth-death-marriage records, census records, military records, land records, correspondence, miscellaneous records, and miscellaneous notes, maps, etc. So a binder might say "Norman - correspondence" or "Sisson - census records," or something like that. When those files get too fat for one 1" or 1.5" binder, they might be further subdivided down into individual family groups of that surname.